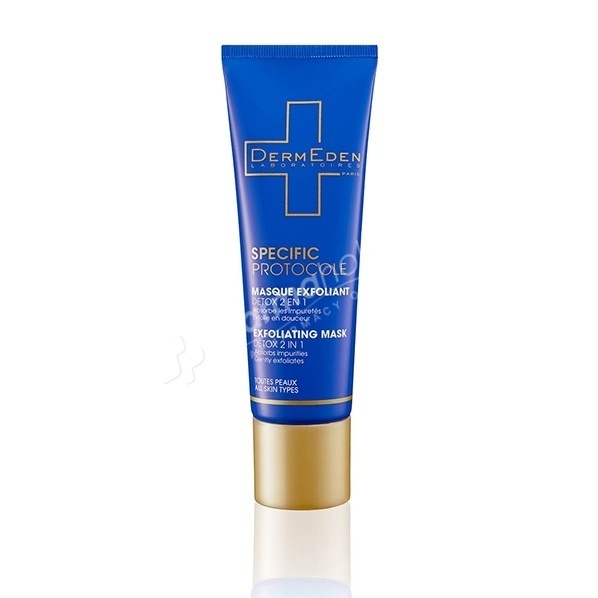 Dermeden Specific Protocole Exfoliating Mask absorbs the excess of sebum and disincrates the pores and releases gently the skin of all impurities, toxins and promotes cell renewal. - Purifying: it absorbs the excess of sebum and disincrates the pores. - Exfoliating: it releases gently the skin of all impurities, toxins and promotes cell renewal. The skin breathes again, it is smoothed and softer. The pores are tightened and the complexion shiny. The "most produced" : vitamin E which has an antioxidant action. Twice a week, apply on your entire face on dry skin and let act for about 10 minutes. Moisten your hands and then make circular movements with emphasis on area T. Rinse with water.